Tim Draper has some bold ideas. Like splitting California into three separate states… thinking Bitcoin will reach $250,000 by 2022… or like back in 2014, predicting Bitcoin would hit $10,000 in three years time (when Bitcoin was only worth $413). So maybe Draper’s ideas aren’t that crazy. He was an early investor in Skype and Tesla, two companies that—regardless of Elon Musk’s regular Twitter gaffes—are alive and influential today. “The future’s gonna be awesome.” Maybe he’s right. [NSFW] Spankchain: An Adult Entertainment Ecosystem Built on the Ethereum network. Whatever your thoughts are regarding SpankChain and the Adult Entertainment industry in general, it’s worth moving past it to appreciate a team that’s building something that they truly believe in. A cryptocurrency-focused law firm based in the U.S., says it has filed arbitration claims against AT&T and T-Mobile on behalf of victims of “SIM swapping” cellphone hacks. Need a refresher on SIM swapping and mobile phone fraud? This read by Krebs on Security is a great primer that covers some solid tips and myths. In a shocking turn of events, former Speaker of the US House of Representatives John Boehner says, “Americans should go all in on weed”. At the American Cannabis Summit (the first-ever nationwide event for cannabis investors) he revealed why he’s going ALL-IN on marijuana… and exactly how ordinary Americans can make a fortune from this hundred-billion-dollar industry. To see a special rebroadcast of this historic event, click here. Hurry and see what this breakthrough investment research could mean for you while you still can. The 2018 buzzword for public companies is dead. Mentions of “blockchain” in corporate earnings calls and presentations have fallen as much as 80% over the last three quarters. 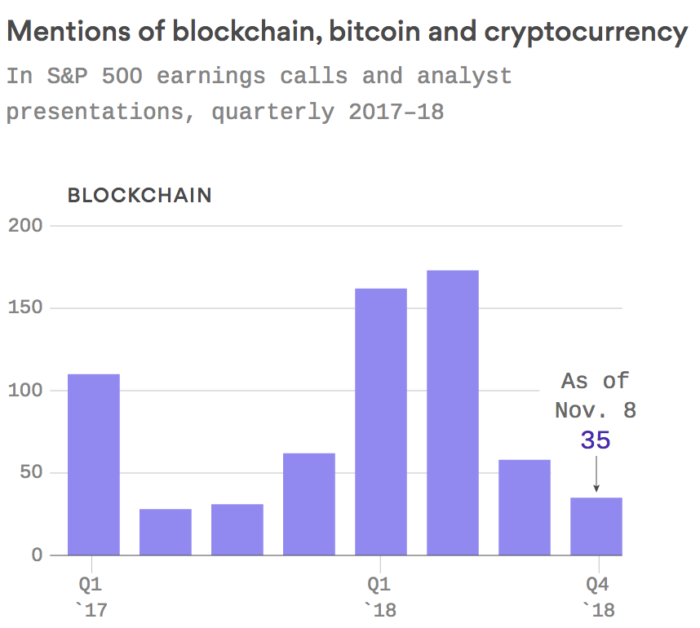 At the peak earlier this year, “blockchain” was mentioned 173 times, according to an analysis of company transcripts by Axios, but the number has fallen to just 35 in November. Talk about worlds colliding. 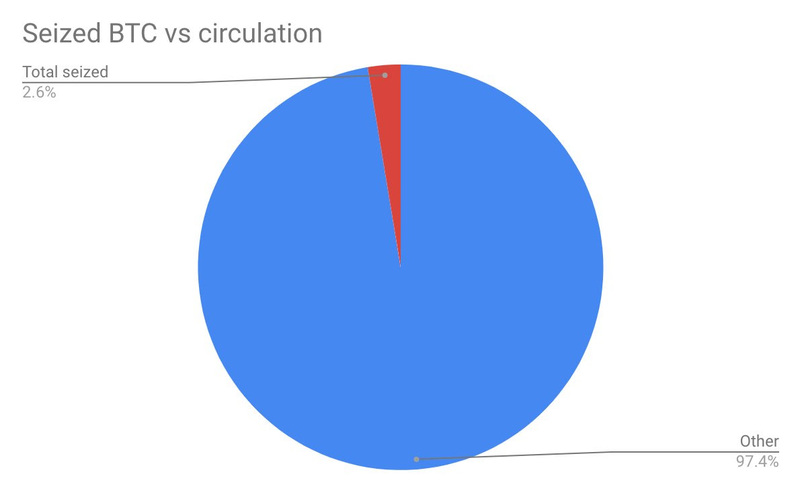 The two great minds of Clay Collins (who we’ve sat down with before) and Nathanial Whittemore (must follow) worked together to create this monster write up on the most common metric in crypto… that’s also one of the most flawed. In a regulatory action straight out of left field, the SEC has formally charged Zachary Coburn, the founder of EtherDelta, for operating an unregulated and unlicensed securities exchange. If you are unaware, this comes as a pivotal move for the SEC as (1) it’s their first EVER direct action against an exchange and (2) EtherDelta is a decentralizedexchange that facilitates trading without a central party. 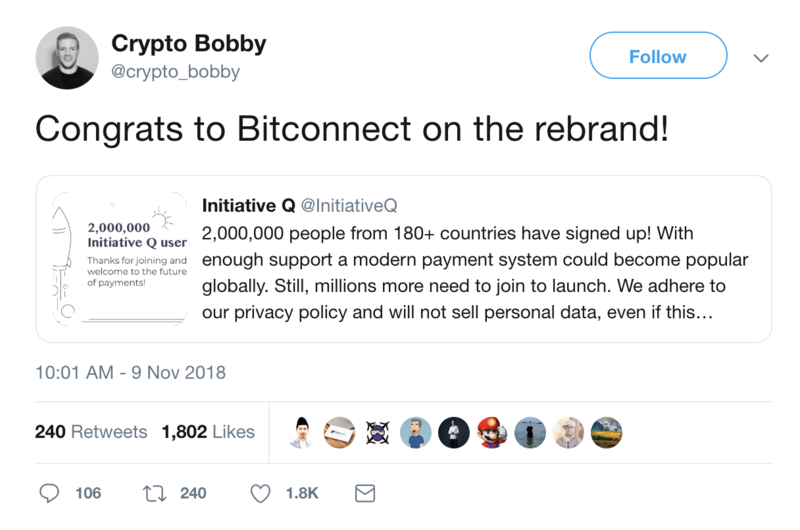 It runs entirely on code, without a group or individual behind it, while centralized exchanges like Coinbase are run by individuals. The biggest takeaway? This is likely the first of many SEC enforcement actions against crypto exchanges. But here’s our favorite lawyer Jake Chervinsky on the entire story, as there’s a lot more to unpack. According to The Block’s findings, the total amount of seized bitcoins is now 1 out of every 40 — 2.6% of the circulating supply.